When handsome 17-year-old Matt Poe moves to a rural town in Iowa, he is the new kid in school. An outsider who can’t fit in, his only friend is his beautiful and sympathetic teacher, Linda Hayden. The older woman is the first to take an interest in him, helping him adjust to the community and keep his grades up. Matt can’t help falling hard for Linda and what begins with a kiss becomes a torrid, secret affair. But his teacher is a lot more than he bargained for and the kid’s wildest dream becomes his worst nightmare. The only people who can save Matt are his two classmates, Grace McCormack and Rusty Shaw. But the three of them are in way over their heads against an evil adult trying to make sure they stay after class permanently. Eric Red is a Los Angeles based motion picture screenwriter and director whose films include The Hitcher, Near Dark, Cohen and Tate, Body Parts, Bad Moon and 100 Feet. Recent published short stories have been in Weird Tales magazine, Shroud magazine and Dark Delicacies III: Haunted anthology. He created and wrote the comic series and graphic novel Containment for IDW Publishing. 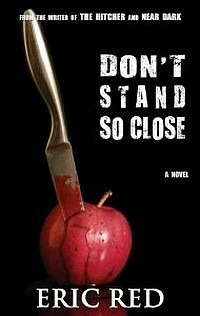 Don’t Stand So Close is his first novel.